Here is one of the most popular Zenith tombstones. The radio is a five-tube super-het that plays on both AM and Shortwave. The dial lights up in a dramatic manner which changes color as you flip between the bands. The radio before you is a fine example, with a nice refinished cabinet in nearly perfect condition. The speaker cloth is replacement and in excellent condition. 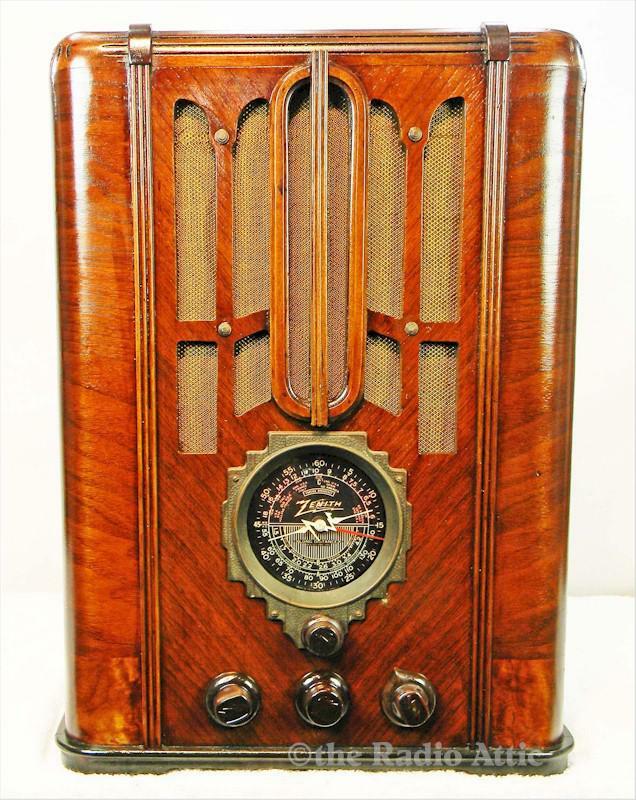 The radio retains the iconic "Z" wood knobs which are Zenith originals. The radio plays like a new set, as Les has done a terrific job in making his repairs. I noted the fine selectivity of the tuner section, and how many stations the radio received with clarity. Les also added a mini-jack for your external input device offering you an unlimited amount of content of your choice. Once you try these external inputs, you will love the option. These are one of the most popular models, nicely sized and a solid player. 17-1/4"H x 13-3/4"W x 9"D.
You are visitor number 675 to this page.